The Tehachapi Renewable Transmission Project (TRTP) involves construction of a series of transmission system improvements extending from the Tehachapi Wind Resource Area in eastern Kern County to the Los Angeles Basin. 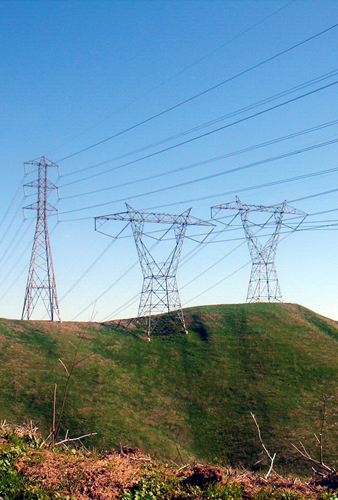 Segments 1, 2, and 3 of TRTP were addressed under separate applications by Southern California Edison (SCE) to the California Public Utilities Commission (CPUC), and this project addressed Segments 4 through 11, which include upgrades within approximately 173 miles of transmission corridors in Kern, Los Angeles, and San Bernardino Counties. The transmission corridors cross public and private lands, and traverse multiple jurisdictions, including 17 cities. Approximately 42 miles of the project are located on National Forest System lands in the Angeles National Forest (ANF). In addition, 6.4 miles of the proposed project are located on land controlled by the U.S. Army Corps of Engineers in the vicinity of Santa Fe Dam and Whittier Narrows in Los Angeles County. Aspen prepared a joint Environmental Impact Report (EIR) / Environmental Impact Statement (EIS) for this project, per requirements of the California Environmental Quality Act (CEQA) and the National Environmental Policy Act (NEPA). The state lead agency was the CPUC, while the federal lead agency was the U.S. Department of Agriculture Forest Service. To prepare the EIR/EIS, Aspen managed a team of 12 subcontractors. A public scoping meeting notice for the project was mailed to over 15,000 individuals, organizations, and agencies, and published in 16 newspapers under a public outreach plan that was prepared and implemented by Aspen, in close coordination with the lead agencies. Nine scoping meetings were held in seven different locations and an additional scoping meeting was held to discuss new alternative routes through the Chino Hills area. Aspen prepared a scoping report that presented all comments received and documented the entire scoping process. The alternatives screening process conducted for this identified 29 potential alternatives, documented in an Alternatives Screening Report (ASR). Three alternatives from the ASR were carried forward for full analysis in the EIR/EIS. Following completion of the ASR, two new alternatives were identified and evaluated in the EIR/EIS, one at the request of the Forest Service in order to reduce ground disturbance within the ANF by maximizing helicopter use during construction, and one in response to requests from the Los Angeles County Board of Supervisors to reduce impacts to the River Commons Project on the San Gabriel River and provide habitat enhancement for least Bell’s vireos within the Whittier Narrows Recreation Area. The Notice of Availability of the Draft EIR/EIS was mailed to over 15,000 interested parties, including agencies, elected officials, area residents, and organizations. During the Draft EIR/EIS public review period, three public informational workshops, two public meetings, and one formal Public Participation Hearing were held. In August 2009, the Station Fire began to burn in the ANF and extensively damaged much of the project area. Publication of the Final EIR/EIS was delayed as a result of the fire, which was the 10th largest wildfire in California’s history. A post-fire evaluation of the project area was undertaken, in compliance with CEQA, to determine whether any changed conditions caused by the Station Fire would result in new significant project-related environmental effects or necessitate new or revised mitigation measures. The CPUC determined that no additional CEQA analysis was needed and released the Final EIR in October 2009. However, the Forest Service decided to conduct a separate review of impacts associated with the Station Fire under NEPA and Aspen subsequently prepared a Supplemental Draft EIS for the project, which was issued for public review in April 2010. The Forest Service released the Final EIS in September 2010 and issued their Record of Decision in October 2010.